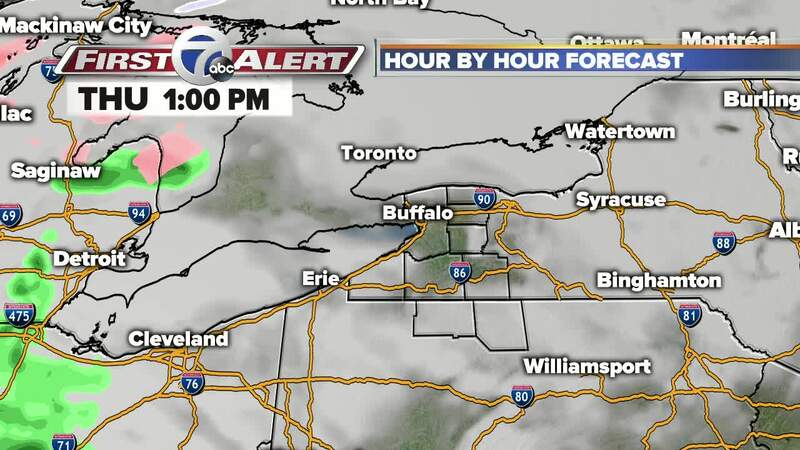 BUFFALO, N.Y. (WKBW) — Everybody, please keep your arms, legs and feet inside the weather roller coaster at all times! We're about to ride through another season. We hope you like it "warm." How warm? Warm enough that you won't need the winter jacket late this afternoon. Florida warm? No. But it'll be a welcome change compared to last week's arctic air. Keep your umbrella handy with you for your walk home from work. A steady round of showers will move through after 3 p.m. The mercury will continue to rise during the evening, getting into the mid 50s late tonight! But a cold front not too far behind will switch seasons from spring to winter just in time for Friday. The winds will begin to howl just after midnight. Expect to hear gusts over 50 mph, which is enough to break tree branches and create some minor power outages. Also, don't be surprised if you hear a few rumbles of thunder and rain pounding your roof at times. And how about those temperatures! We'll be going downhill after midnight! By the early morning rush, temperatures will drop back to around 30F. We'll be in the mid 20s by lunch with some scattered snow showers. Strong winds will persist through the rest of Friday. Finally, nature chills out a little. We'll start off the day with a noticeable breeze and a few early morning flakes. Winds will slowly calm through the second half of your Saturday.